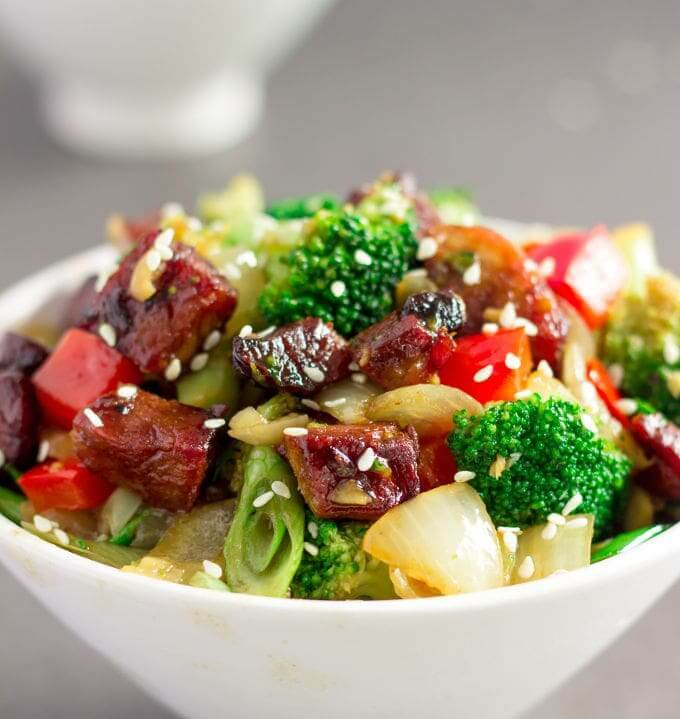 Stir-fry is a great weeknight go-to for family dinner with endless possibilities! Shrimp, salmon, steak, chicken, tofu, vegetable, pork…. whatever you are in the mood for, there is an amazing stir-fry recipe to hit the spot. 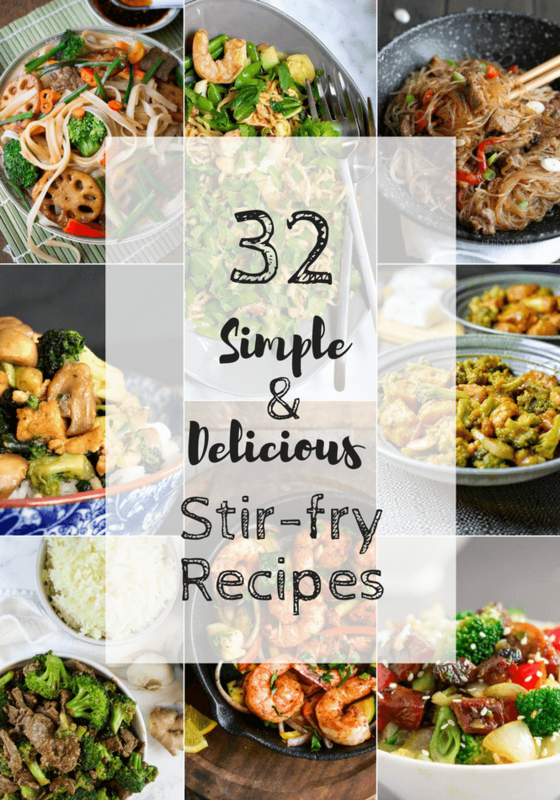 I am bringing you 32 Simple and Delicious Stir-Fry Recipes from around the web today starting with chicken stir-fry ideas! Healthy Chicken and Vegetable Stir-fry with Peanut Sauce from Carmy. 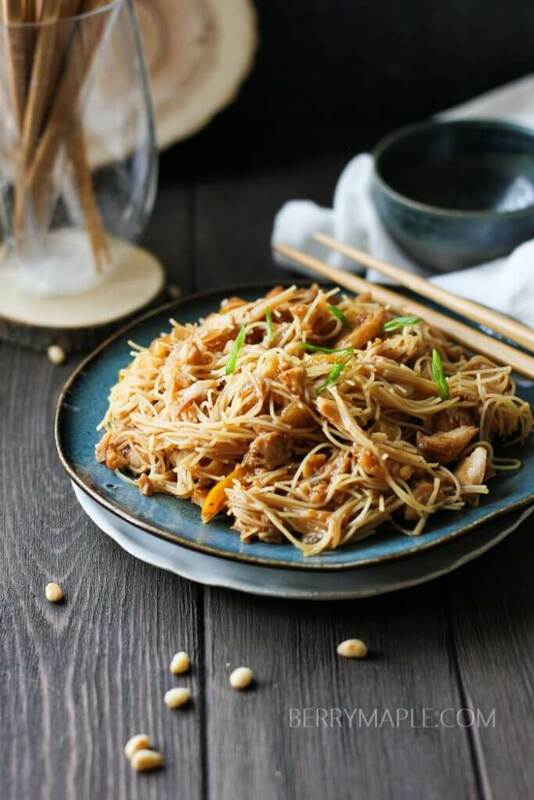 Chicken with Easy Stir-fry Sauce from You Brew My Tea. General Tso’s Chicken and Broccoli from Dude That Cookz. 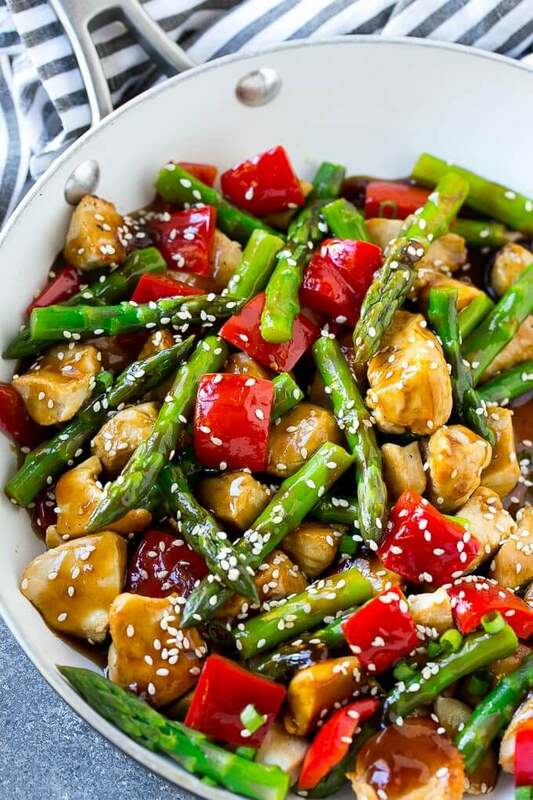 Spicy Chicken Stir-fry Recipes with Onions and Peppers from Melanie Cooks. Asian Chicken Thighs with Vegetables from My Life Cookbook. Lomo Saltado Peruvian Stir-fry from My Gluten-Free Miami. Marinated Beef Stir-fry with Rainbow Vegetables from Slow the Cook Down. Zucchini Stir-fry with Beef and Pesto from Wholesome Yum. Spicy Beef with Longevity Noodles from Healthy World Cuisine. 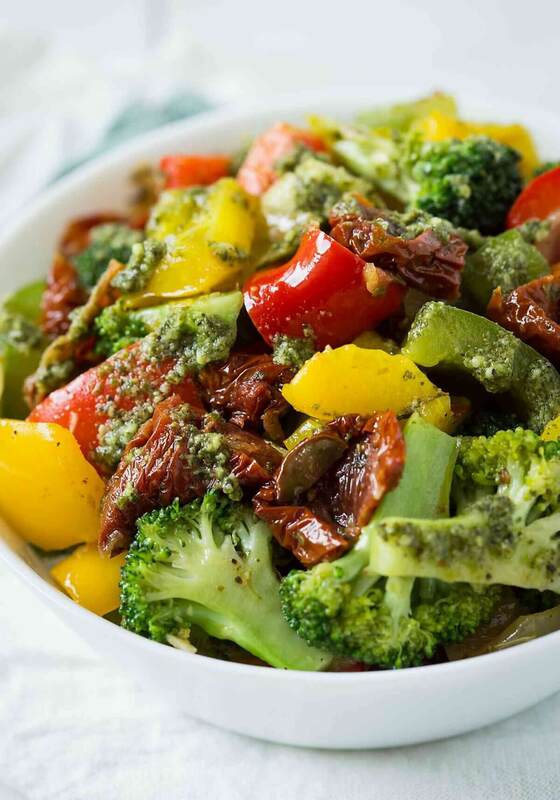 Gluten-free Beef and Broccoli Stir-fry from here at Simply Made Recipes. Glass Noodles Pork Stir-fry from Berry & Maple. 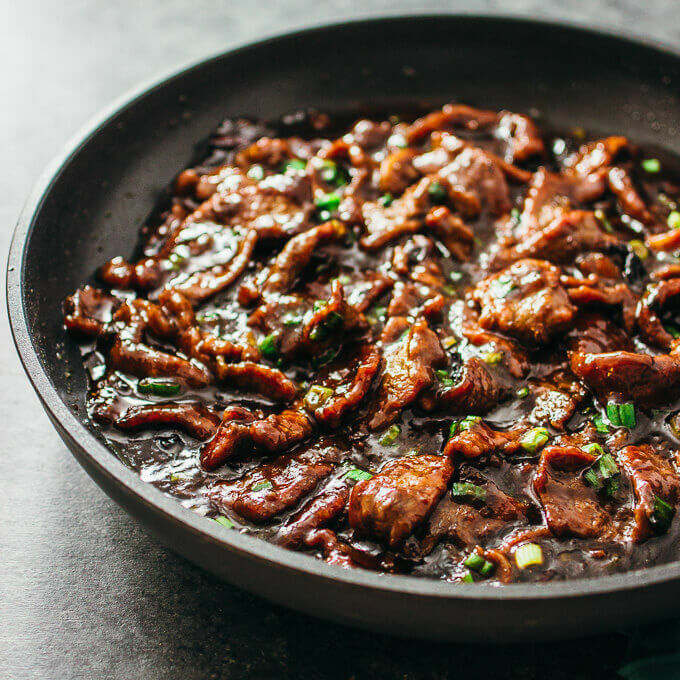 Easy Pork Shiitake Mushroom Stir-fry from Healthy World Cuisine. Easy Garlic Pork Stir-fry from The Salty Marshmallow. Quick and Easy Caramelized Pork Stir-fry from The Cook Report. Ramen Noodle Stir-fry with shrimp from Pinch and Swirl. Korean BBQ Salmon Stir-fry from Strength and Sunshine. Healthy Shrimp Stir-fry Recipe with Snow Peas from Curry Trail. Coconut Curry Shrimp Stir-fry Bake from Messy Cutting Board. Albacore Tuna Stir-fry from Big Bear’s Wife. 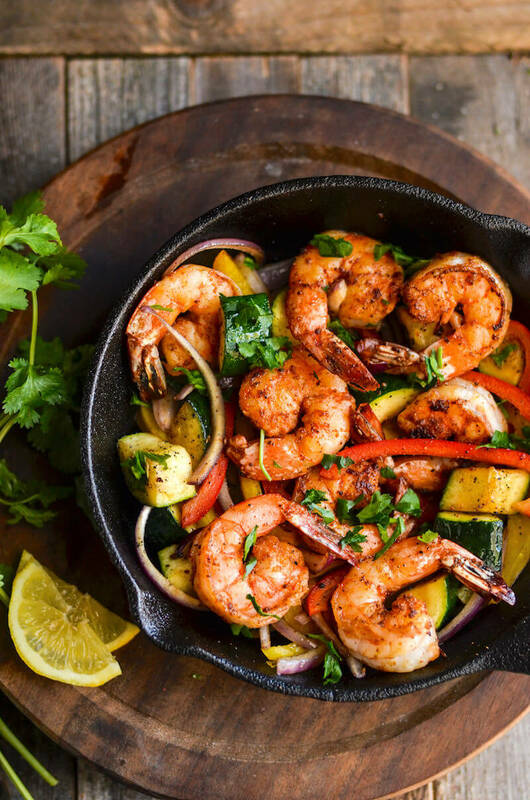 Delicious Paleo Shrimp and Veggies from DIY Candy. 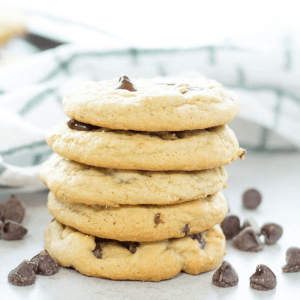 This recipe is our featured photograph at the top of the page! Vegetarian Tofu Stir-fry from Mama Likes to Cook. Vegetarian Red Curry Stir-fry from Happy Kitchen Rocks. Peanut Tofu Stir-fry from Rhian’s Recipe. Broccoli Tofu Stir-fry with Basmati Eice from My Gorgeous Recipes. Vegetable Noodle Stir-fry from Diabetes Strong. Easy Shrimp and Broccoli Bowls from Salt and Lavender. The Easiest Vegan Pad Thai from The Petite Cook. I love stir fry and I’ve been looking for healthier meals to make at home. I’m not the best cook so I like that it’s simple to make. These look great! Def want to try that General Tso’s dish! That sounds delicious! These are phenomenal, we love stir fry! I’m saving this post to my bookmarks. Can’t wait to try some of these, especially the Hoisin Pork Stir-fry. I’m always looking for new recipes to try with the family! That one looks amazing! It is on my dinner line up too. When we first got married I made stir fry every other night, I literally just threw chicken chunks and veggies in a pot and thought I was the most clever cook. Needless to say we haven’t done stir fry in a while (like 10 year a while), because we ate so much of it haha. May have to revisit it though with my more advanced skill set that I have now acquired in cooking department. These look so good! There you go! There are so many possibilities with stir-fry too… switch it up a bit and try some noodles or salmon. Oh yes, we always make a little extra for lunch left-overs!